It’s rare that a SaaS company invests a lot of time, money and efforts in its user onboarding, adoption and in-app experiences. However, whenever we find such a company, we make sure that everyone can learn from its experiences, UX tips and user onboarding methodologies. Also, we did a user onboarding teardown as well, so be ready to collect as much information as you can! 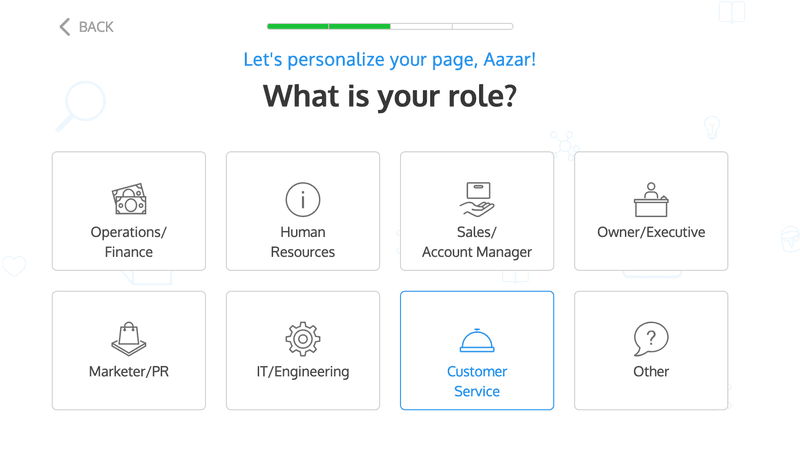 We chatted with Naser Alubaidi the Head of Growth of Venngage to talk about Venngage’s amazing user onboarding. He saw immediate results to their activation and conversion rates by implementing such kind of onboarding. Venngage is an easy to use website where the most design-inept can create stylish content for websites, presentations, ads, social media use and much more. There are templates for a wide range of projects including infographics, reports, posters, promotions and social media images. Before the interview, we went ahead and tore down their user onboarding flow. There are some great learning points for you. However, the interview was conducted separately from this tear down video. Highly recommended to check it out. Let’s move on to the interview to understand Venngage’s perspectives. 1 – When did you launch this amazing onboarding? We launched the latest version of our onboarding around a year and a half ago, but have been continuously improving the flow and personalizing it further to our target audience every chance we get. 2 – What were the results before and after implementing this kind of onboarding? We’ve seen our creation rate (percentage of users who end up choosing a template) increase to 85% after implementing the latest changes and our completion rate double ever since we added all the tooltips and help guides. 3 – You have 8 personas/use cases in place – How did you come up with it? The team at Venngage analyzed our users and found that those 8 personas either make up the biggest percentage of our user base or are the most engaged users at Venngage (or in most cases, both). We are, however, continuously monitoring our data to determine if another persona should be added and/or removed from the list. – What type of visuals they need, etc. 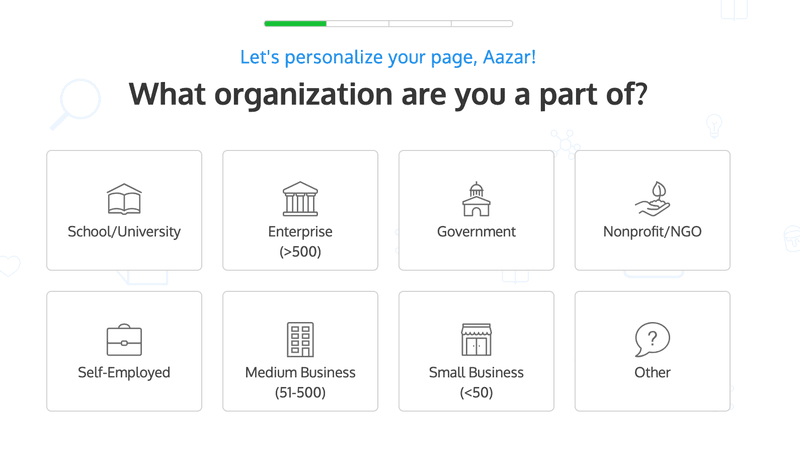 4 – Do you personalize the onboarding based on personas and type of the organizations? Yes, we anticipate what visuals they are more likely going to be needing and cater specifically to their unique needs. We are also in the process of personalizing our emails to cater to each user’s unique needs at Venngage. We use the information we gather from our onboarding (job title, industry, etc…) to personalize the onboarding emails we send. For example, if a user is a marketer who is looking to create presentations for their organization, they’ll receive emails that recommend the best presentation templates, share blog posts that share presentation tips, ideas, templates, etc… We believe that each person’s goals are unique with Venngage and would love to eventually cater to each person’s exact needs! 5 – How did you go about UX and customer research for Venngage? Very simple: we spoke to our users! We thought we knew initially what our users wanted, but it wasn’t until we spoke to our most engaged users that we found out that most of our assumptions were exactly that: assumptions. I highly recommend teams to speak to their users, find out how and why they use your product, what their unique pain points are and how your tool can add the most value to those people! 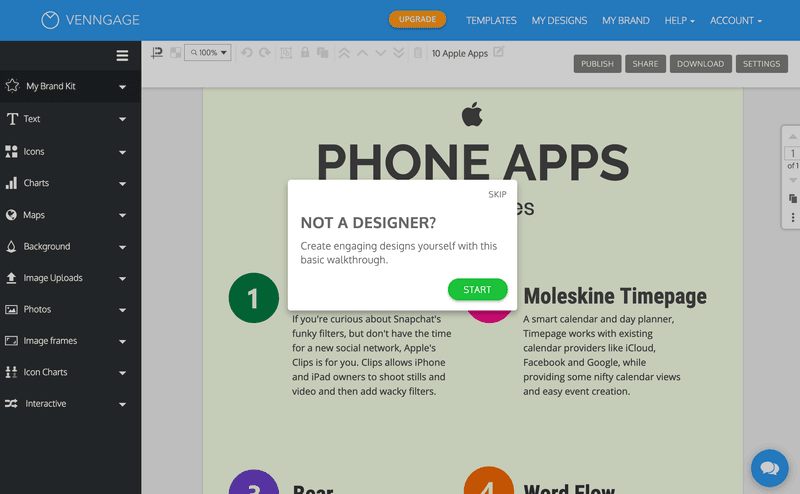 6 – I see there’s an onboarding for “Not a designer” – How do you onboard a pro? A pro’s learning curve will likely be much flatter than that of a non-designer. So since Venngage’s mission is to make design accessible to everyone, we anticipate that a pro would be able to use Venngage without needing to walk them through every single feature. We do, however, make all our helpful guides and blog posts accessible so anyone could find an answer to any issue they are facing at any time. 7 – What’s a product-qualified lead for you? How did you come up with it? A product-qualified lead would be a user who falls in our ideal segment and has created an infographic and made edits to it. This is because we anticipate that they’ve hit their AHA moment if they’ve followed these specific steps. This is based on years of data as we are strong believers that not all leads are created equal and that every company SHOULD have a different definition of what a qualified lead is to them. 8 – Could you share some insights on segmentation? 9 – How do you further activate the user once he/she is “activated”? We continue to activate our users with weekly emails. Our emails are usually either template recommendations, recommended blog posts or product announcements. Most of our emails are “inspirational” emails that could help our users create their next design, for example: How to Create a Successful Marketing Plan (20+ Marketing Plan Templates). We found that these blog posts perform the best with our users as they provide actionable tips that help them create presentations, infographics, cover letters or any other kind of design we think they’d be interested in. 10 – Has there been any impact on your churn rate, expansion rate and upselling due to this amazing onboarding process? Absolutely, we’ve seen a huge increase in creation and completion rates as I’ve mentioned earlier. We’ve also seen that our upgrade rates increased a lot after implementing the new onboarding and we continue to see it increase month after month. 11 – Do you have any word of advice for someone who is using a tool like Userpilot to optimize their onboarding? Yes, never stop testing, improving and optimizing your onboarding experience. Talk to your customers, understand what they are looking for, identify areas of improvement and test everything over and over again! Naser also gave some user onboarding tips in 2019 if you want to learn more. You can find him on Linkedin. Hope you enjoyed the interview. If one thing you want to take away from this interview that would be talking to your customers to improve your onboarding process. If you’re looking for a free trial or freemium audit, work with Wes. He will gladly do your free trial teardown. What was your key takeaway from this teardown and interview? 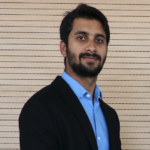 Aazar Ali Shad is the VP of Growth at Userpilot, and has more than 5 years of SaaS Experience. He is currently helping 200+ SaaS companies improve user onboarding and increase product adoption.